The car of tomorrow will scan your thought patterns and predict your next, says Nissan, which is collaborating with the École Polytechnique Fédérale de Lausanne in Switzerland (EPFL). Brain machine interface (BMI) systems developed by scientists at EPFL already allow disabled users to maneuver their wheelchairs by thought alone. “The idea is to blend driver and vehicle intelligence together in such a way that eliminates conflicts between them, leading to a safer motoring environment,” said Professor José del R. Millán, project leader. 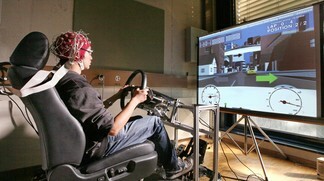 The Nissan/EPFL collaboration is using statistical analysis to predict a diver’s intentions and evaluate their cognitive state relevant to the driving environment, using EEG and eye-movement patterns, and by scanning the environment around the car in conjunction with the car’s own sensors. The goal is to predict what the driver plans to do — a turn, an overtake, a lane change — and then assist with the maneuver in complete safety, thus improving the driving experience. The development is part of Nissan’s six-year Power 88 plan, which includes three safety systems they’ve already developed: Intelligent Cruise Control, Distance Control Assist, and Moving Object Detection.